When I prepare for my three meals, I have a picture of the food pyramid in my head. I try to incorporate a lot of fruits and veggies into each meal, and select whole grains instead of processed white grain products whenever possible. Nuts and legumes are good. But I think I should incorporate them more into my diet and I also should eat more chicken and fish and less processed meat. This pyramid must also include exercises as shown in the first pyramid above. I want to live a quality life even when I reach the age of 80s or 90s. How can you enjoy a good life without good health? Besides a good diet, exercise and physical activity (for endurance, strength, balance, and flexibility) should be incorporated into a routine over a weekly schedule. I try to do weight lifting one day & jogging another day; I also enjoy outdoor activities such as hiking and walking the dog. (You can go to meetup.com and join a hiking group near where you live.) I also volunteer to lead a 45 min. Chinese exercise (Beijing Rejuvenation Therapeutic Exercise) at a senior center every other Saturday. Healthy diet alone is not enough; to maintain good health one must also keep an active life style. In Chinese, the word “activity” is made of two words: huodong (活动）. “Huo” means “to live.” “Dong” means “to move.” To live (well), you have to move. （要活就要动。）Select both indoor and outdoor activities that you enjoy and get a moderate amount of sunshine to keep your wellness at the most optimal level. I don’t understand why there are so many fads about dieting. Be wary of any diet that is a quick fix or says you can eat anything you want and don’t need to exercise to maintain weight. The only diet one should have is a healthy diet and keep a good regiment of exercise. Here is your first step in a healthy diet: From now on, refrain from drinking any sodas as much as possible, and avoid eating any deep-fried food. Then keep the above food pyramid in mind before and when you consume any food. With good self-discipline, everyone can enjoy a healthy life style. After a while, you will find anything harmful to your body aversive and actually ENJOY savoring healthy food and living a healthy life style. People are bound by conventions. But it can be an impediment to your progress in health. Why do we need to adhere to conventional meals that are unhealthy? (Who says that you can’t incorporate a good salad into your breakfast? Or you can’t eat a bowl of cereal with cut fruits for dinner?) Incorporate veggies and fruits into every meal. Think outside the box, and create each meal according to what is good for you and for the people you love. 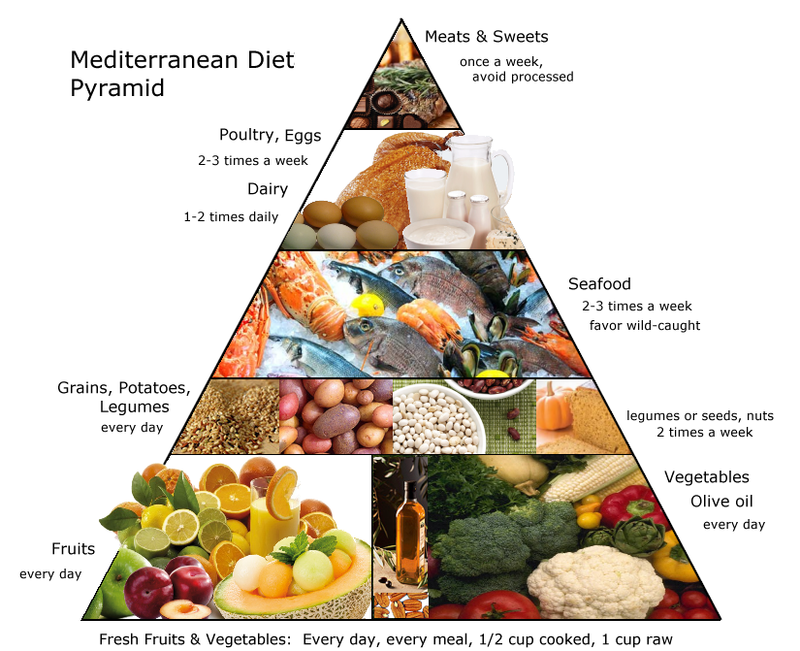 I highly recommend the two food pyramids shown in the beginning of this article; however, I do feel that there is one big component missing in these two pyramids: Water/Healthy Drinks. What liquid you use to hydrate your body each day has a great impact on your health. Drinking a lot of water each day is essential in maintaining good health. Many people love to begin a day with a cup of coffee. I have recently gotten into the habit of drinking a cup of coffee in the morning; while some may warn you not to drink coffee on an empty stomach, I like to drink it the first thing in the morning because it makes me more alert and kick-starts my metabolism. It is a good stimulant for purging the wastes from your system. Since it has a high content of caffeine, I try to limit myself no more than two cups a day. coffee past three for fear of keeping me up at night. To prevent from esophageal cancer, these experts also warn not to drink super hot beverages. Let the hot drink cool a bit before drinking it. I am an advocate of green tea as a healthy beverage. Green tea is rich in antioxidants; it is loaded with polyphenols like flavonoids and catechins as well as epigllocatechin Gallate (EGCG), which function as powerful antioxidants. These substances can reduce the formation of free radicals in the body which are known to play a role in aging and all sorts of diseases (10 Proven Benefits of Green Tea). These antioxidants and nutrients protect cells and molecules from damage and thereby have powerful effects on the body. Don’t add sugar into green tea. I promise; you will love to drink it without any adulteration of sugar after a few tries. Green tea has caffeine, so I reuse one bag of green tea many times throughout the day before I toss it away. It adds flavor to water and encourage me to drink a lot of water every day. You will find that you can stay thin and your skin stays youthful partly because of this tea drinking habit. I am a fan of Kirkland’s Green Tea. You can get it at Costco; The whole box has 100 bags but the price is quite reasonable. Drink at least 8 glasses of water (some in form of green tea) instead of sodas. Avoid deep-fried food and junk food as much as possible. Incorporate healthy nuts and legumes into your meals and between your meals. Take multi-vitamins, Vitamin D3, Calcium, and Vitamin C every day. Maintain a good relationship with friends and family. (I must include this one as well. Maintaining a good social network is said to be the key to happiness according to Harvard’s longitudinal Study–What makes a good life? Lessons from the longest study on happiness). These simple things will keep us healthy and help reduce the obesity problems facing many people in affluent societies today.